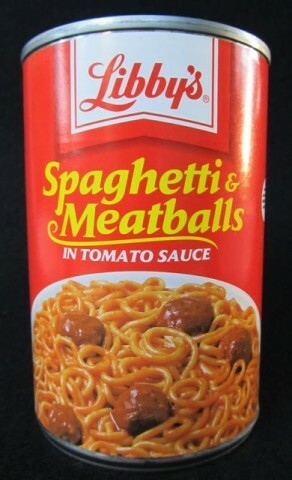 Delightfully Anachronistic Package Design: Libby’s Spaghetti & Meatballs! As you know, I get all sweaty and excited when I see some sort of food product, nearly always at the 99¢ Only store, whose package design belies its very…existence in the year that it currently…is. Do you follow? Take for instance the specific item I’m going on about this time. It’s a can of Libby’s Spaghetti & Meatballs. In tomato sauce. The thing is, it doesn’t look like a food product you’d see here in 2011, right? I’m not talking about the actual food inside, but the way the label is designed. It looks like it’s much older. Right? It’s not just me, right? Okay. But no! That’s just it! It’s a current product! And yet the color scheme, the typeface, everything screams, I dunno, the mid-1970s! “But how do you know it’s not from the mid-1970s?” you sneer derisively. Ready for this? Because in the mid-1970s, back then, Libby’s had a contemporary logo! Remember? By the way, thanks to http://trade.mar.cx/ where I found that. Now, most of the delightfully anachronistic package design foods we’ve visited over the past months have labels that we must presume have endured for years and were never updated. Libby’s, however, is unique on account of it was updated, and now it looks dated. Not terribly dated, but dated nonetheless. And here’s something else: Libby’s meat products, like these delicious spaghetti and meatballs – and brother, they were great! – are from the good people at ConAgra Foods. But Libby’s vegetable products, like your gourmet tiny early June peas, your whole kernel succotash and the like comes to you from the good folks at Seneca Foods. Confused? Don’t worry. You’re the only one who read this far. Posted by Ted on November 23, 2011, 6:00 AM.